I have just implemented this great plugin on my site (please follow link to see the issues). I am using txp:tru_tags_from_article to show the keywords below excerpts and full articles. It works very nice and fast. But I am listing keywords with ’, ’ (comma + space) and the clean URL then always has a leading dash for all keywords but the first. The second presentation glitch follows on my tag search result page where I am using txp:tru_tags_tag_parameter in the headline and the keyword shows up with the leading dash. Do you have a solution or patch for that? It should be sufficient to have an additional search and replace in function tru_tags_handler which would replace ’, ’ (n-spaces) with a single comma. But I don’t want to touch the code. The URL is OK when I enter keywords without space after the comma but I don’t want to do that because I am also using txp:keywords to get the keywords in the order as I entered them. It would be nice if you could reply with a mail (also). PS: The clean URLs in the keyword cloud are OK and don’t have the leading dash. Thanks Nathan! It works like a charm now. That’s really a great plugin, I have just used it on one of my sites. But I would like also to use paging, could you please advice me how to do it? please tell me it is possible to make each tag capitalized when they are in a list. I am having a lot of trouble with tru_tags_handler in that it never actually puts up the article, I can get a link cloud from it only. I took a look at your website, and it seems to be doing sane things. If I look at this page I get a tag cloud, and if I look at this page I get a list of articles. Can you describe your problem in more detail? Hi Nathan— I made the additions to .htaccess and set clean URL’s to 1, and the URLs produced look right (clean), but when I click I get 404 Not Found. Any idea what’s wrong? It’s hard to know exactly what’s wrong, but it’s very likely a problem with the .htaccess file. Can you send me yours in an email, and I’ll see if I can figure it out? Nathan, thanks for the plugin, it’s amazing! Could you please advice me how to display a name of a tag in the title? I want to do something similar than you do here on your website – when you click on a tag the title of the tag is displayed in the title. E.g. tag: textpattern. How do I do that? Nathan, thanks a lot! I’m gonna try this. How come the name of a tag will be displayed after the colon? Is it somehow automated in the plugin? I’m just trying to get the name of the current tag displayed in the title. I know it must be easy but I can’t figure it out. in there, but I forgot to put the spaces in it and textpattern wiped it clean out. I fixed the original comment. I’m not sure what you are asking here – if you look at the HTML source for a generated tag cloud, you’ll see that each tag has a number of classes assigned to it. You can create your own CSS rules that use those classes to style the tags. Is that what you’re looking for? This tag can be used anywhere and will return the name of the current tag under search, during a tag search. 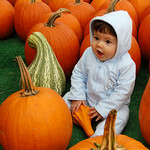 This is generally used with tru_tags_if_tag_search. It accepts one parameter, striphyphens, which will convert all hyphens to spaces in tag names. This is useful because tru_tags will convert spaces to hyphens when it does a tag search, and this undoes that conversion. Great update of the documentation! The only feature I miss right now is a possibility to maintain keywords i.e. Search & Replace. An added value of ‘keeping’ changed keywords for a while would be great. Most people starting with tags will have a need for cleaning up their tags after a while. As search engines already indexed the ‘wrong’ pages it would be great to have a redirect possibility. Thanks for the great plugin. Really useful. One question. Is it possible to have the linked tags in the feeds ‘body’ linked to another site than my TxP site? I would like it to be http://bloggar.se/om/[tag name] but only in the feed. Maybe that isn’t possible at all. Thank god for your plugin! I just installed tru_tags and it is working like a charm in every way but one. Last night I want back through a bunch of my old posts and started tagging them up — at some point despite me not making any plugin or admin side changes beyond keywords … the clickable tag listed below keyword dissapeared. What should I do to get them back? I’ve checked the plugin language and it is still marked to be included. Hi Nathan, just found your plugin – great stuff! I’m going to try and implement this instead of chh_keywords, as I’ve had problems with it. By the way, are you for hire? Thanks! I am somewhat for hire, in that I’ve done contract work in the past in a few situations. I’ll send you an email so we can chat privately. And yes, you’ll need TXP 4.0.4 to use tru_tags 2.0. You can use tru_tags v1.0 with 4.0.3, but v2.0 is a pretty big improvement over 1.0 so I’d suggest upgrading TXP. Parameters should be written correct and an example should be provided (texttransform=“capitalize”). # usenofollow=“1” will turn on rel=“nofollow” # usereltags=“1” or usereltags=“0” (default) ... sets the rel=“tag”. Is it standard conform to use both and still have a valid anchor?? Good point about the instructions for texttransform. I’ve updated them appropriately. I reworded the usereltags instructions to make them clearer. And yes, you can include both words in the “rel” attribute and that should work (per the spec). I didn’t test it yet (just testing a tru_tags solution for a forum question :) and I did not read the complete spec. Is the correct output rel=“tag nofollow”, rel=“tag, nofollow” or rel=“tag” rel=“nofollow”? Markus, sorry about that. It was a documentation problem. The correct attribute name is “usereltag” (without the “s”). Nathan, how to get a raw list of related tags? The most naked result I get are tags still surrounded by span tags. I recently installed your plugin but I’ve got a problem. The ‘tag’ section works (http://www.sverschuren.com/tag/) but when I click on a tag, like ‘Zwemmen’ it says ‘page isn’t found’. Thesame from the Tag cloud. Greetings from the Netherlands and thanks for your wonderfull plugin. Sebastiaan – thanks for letting me log into your site. It looks like there’s an incompatibility between rss_superarchive and tru_tags. Both try to rewrite the URL to meet their needs. If I turn off rss_superarchive, it makes tru_tags work. Nathan… I’m using tru_tags and rss_suparchive together without problems. If you’d like me to test anything out then let me know. I just installed your plug-in, no problems with that, thanks! How can I get rid of the space before the commas? No problem at all – I’m glad you like it! However, I have a question: Is there a way to batch change tags like you can do it e.g. at flickr? I’ve just upgraded from version 1.6, and I have to tell you again how much I love this plugin. It’s such a useful thing, and so well implemented. One question: does tru_tags_if_tag_search support ELSE? I would like to customize the tag cloud page at /tag, and this would enable me to do so. Yes, tru_tags_if_tag_search does support “else”. Let me know how it works – I’m interested to see what you do. It’s possible that something changed in 4.0.5 to break this, but I’d be surprised. Can you give more detail on exactly what does work and doesn’t work? You should also make sure that “Include In Site Search” is set to “Yes” for all of your sections – this post will help explain why. Hi Nathan, thanks for your help. You are right about setting yes to “Include In Site Search” in order for it to put all the tags from different sections. It is working now. Thanks again for the really great plugin. Wonderful Plugin. I just thought of how to realize a tagclod – and now it’s there. When I click on a tag in the tag-cloud, all tagged articles are listed. How can stop the comments and the comment-form being listed with them? This looks great, but the one thing I don’t get is “tag search”…is there a way to actually have a search field post to a page with tru_tags_handler in it and return articles with similar tags? For example, is it possible to search on the term “george” and get back articles tagged with “george washingon” and “george clooney”? 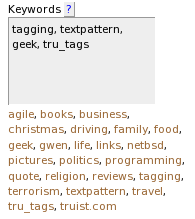 Or is “tag search” just the function of pulling up a list of articles with a given tag? Hi, I hope you’re still developing this plugin, as i’ve encountered a problem with the admin-side. The tag list isn’t showing, exactly as Tony mentioned. I am no coder, so I can’t be much help on this, but i can tell you that the JS code still appears underneath the “Publish” button. Bastian – did you ever get this sorted out? tru_tags uses the standard search forms, so you should see whatever output you see when you do a search. That’s something you customize on the admin-side, by editing some of the standard forms. But the tags list it generates, even if clickable, still return to the tag list itself (adding the tag at the end of the url). a click on a tag returns a list of article body, not excerpt. Is there a way to tweak this? Any help appreciated. You should be using tru_tags_handler, which will in turn render articles using whatever “listform” you define. By default, that will be the form named “search_form” (in the TXP admin), but you can override it via the “listform” parameter to tru_tags_handler. It sounds like you need to either create or customise your “search_form” form. “Is it possible to have the linked tags in the feeds ‘body’ linked to another site than my TxP site? I would like it to be http://bloggar.se/om/[tag name] but only in the feed. Now I have got tru_tags to point to http://bloggar.se/om/ on my site. But pointing to my site in the feeds. And becuase of that my site doesn’t show up on bloggar.se I will have tru_tags to point to http://bloggar.se/om/ both on my site and in the feeds, but can accept the solution Emil W asked for. I’m not struggling anymore. I’m happy! I find the magic tru_tags_feed_tags solution in your text. Now I can go to sleep. Thanks anyway, not at least for tru_tags. Magnus – that’s great :) I’m glad it worked out for you. Sorry to disturb you again Nathan but is there a way to make it possible to combine two words to a keyword, like names, and keep the space between them. Now it always been a – between the words instead of a space. Magnus – I’m not sure what you’re asking. Tags with spaces should work just fine. The dashes only appear in the URL. thanks for this wonderful plugin. I’ve been using it since its early release and now I uprgarded to the latest version. I’m running into small problem though. I can’t seem to find out how to “turn off” the tags from the Writing tab. I don’t want them to be displayed there. In old version of your plugin it was done by editing the source code but now it says that everything is done via Extensions tab. I don’t have there an option to turn off the tag cloud from my Writing tab in Admin tab. I’m using the latest version of your plugin and the latest version of TXP. Do you know what’s wrong there? That’s great to hear – I’m glad you like it. On the issue with turning off the tags on the Write tab, it’s the very last option on the right side of the configuration tab (in ‘Extensions’). It’s called “Show a clickable list of tags on the Write tab”. Set it to No, and you should be set. I’m guessing that the error (with “radio_list”) that you are seeing may be preventing you from seeing that setting, though. radio_list() is a function in TXP 4.0.5 (see here), and in the latest development version. Are you using 4.0.5? Thanks for the answer, Nathan. You are right, I’m using TXP 4.0.3, not the latest version. I’ll update today and I’m sure the radio list will be visible. No problem – glad I could help. I didn’t realize that radio_list() was new in 4.0.5, so I updated the ‘releases’ page to make the dependency clear. Enjoy! Excellent plugin, all round. I’ve just installed it into a new textpattern site. Got it to work with my template, after some fiddling. I’m seeking to remove the tag cloud that appears by default on the top of the page. I can put the cloud into the sidebar. I don’t see mention of this behaviour by default. You can see what i mean at my url given in this comment form. One more question: is it possible somehow to post remotely using a trutags in the body of a post? thank you very much: i searched for a way to implement something like extended categories. so i’ve messed around with rss_uc for about a day, without success. tags are anyway the better solution for me, and your plug in worked perfectly well from beginning. i love it, thank you very much. johnplum – thanks! Also, looking at your site, it looks like you’ve worked out the problem you were having. If not, please email me privately. (I’ll email you momentarily.) For the remote-post feature: I don’t think there is a way, now. I imagine that this is because you have a way to email in posts? If that feature supported a way to get things into the Keywords field, that would work. Yes Nathan…problem solved, somehow. I worked hard and fast in initial customising. THis is a classy plug.. I can send to trutags/keywords with mt_keywords, and do this with Tinderbox. I don’t have a mail programme doing this, it would need the XLM_RPC protocol in a script…it could be set up, there may be one around already…i shall look shortly. How can I can adjust the plug-in in order to show me only the titles of the articles when I press a tag, not the whole article? Best regards and thank you for a useful plug-in! liberskol – the plugin uses the search_results form to render its output, unless you override that form using the tru_tags attributes. You should be able to customize your search_results form (or other specified form) to get the display you want. 2. Is it possible to somehow extend the tagging to images in Textpattern? I’m working on a site where it would be great to do a tag search and see results for the appropriate tagged articles, images (and I guess files). For #1, yes it is possible – just set the “break” attribute appropriately. For #2, no, it’s not currently possible (without associating an article with every image). I created a “tag” section and my default “search_results” form is still intact and untouched. However, the <txp:tru_tags_handler /> is not showing the list of articles for the tag. I get the title of the section and the current day’s date. I’ve verified that I put it in the same page that I specified under my sections. I also know that the “else” portion is working, as it displays my other articles. Any suggestions on what else to look for? You might just have a problem with a mis-closed tag somewhere. I’ve had a similar problem before, and it turned out to be a missing close tag. What happens when you generate a tag cloud – are the tags there? That may give a clue. tru_tags_handler doesn’t (by default) show articles that are hidden or future-dated, so are all your articles visible on the normal site? 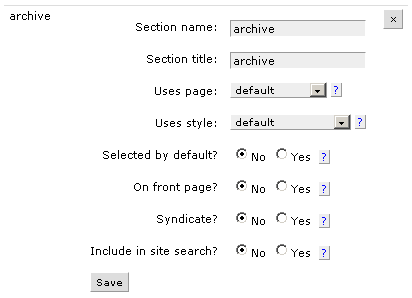 Are all your article sections marked “searchable” in the admin? What happens if you search for words that are in the tagged articles? 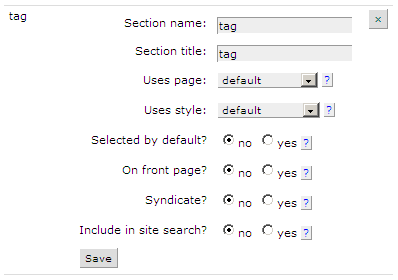 Have you changed any settings on the tru_tags admin page (on the Extensions tab)? Any chance there’s a publicly visible example I could see? Also, just for future reference, you’ll usually get faster responses on the forum, just because there are more people paying attention. (And I see both posts the same way – through email.) Posting here is totally OK, but I thought you might want to know about the better option. It works perfectly but i have a problem with the encoding – though my site uses unicode cyrillic, nevertheless, tags look like rombs with question mark inside. Wow. I was just thinking what a brilliant add on to many TXP sites and what a shame the list of building tags was not presented in the Admin side when I saw it was — and brilliantly. Thanks SO much for this excellent add-on to TXP. Loving it. Alan – thank you very much for your comments! I’m glad you’re enjoying tru_tags. just wanted to show some love. this plug-in rules. nice with all that tiny little features, all that is really made pro. jens31 – thank you very much! Maybe something like this is better to understand? This has to be some of the best textpattern plugin documentation I’ve seen. Fantastic! Thanks! I’m glad you find it useful. I’ve recently updated from a somewhat ancient version of tru_tags, and I love the new features. I’ve run into something interesting while addressing an unrelated issue, and I wonder what you think: Though I have clean urls turned on in tru_tags, zem_redirect pro interferes and rewrites all tag urls in the /?=section&tag=etc form. I confirmed this by switching off zem_redirect and checking the tag urls: Nice and clean. Do you think there’s any way around this? I’m bewildered by redirects and would gladly ask zem if he were still working in the txp community. Any ideas? Sadly, I can’t do much to help. I don’t really understand how all the clean URL stuff works. There have been many different solutions, and mine is simply the best of the others that I found. I’m not sure what Zem is using, and I don’t have access to his code. I also worry because his page says “May not be compatible with custom clean URL plugins and add-ons, or with other URL redirection tools.” That probably means that it won’t work with tru_tags. Thanks for giving it some investigation, Nathan. The plugin load order in 4.0.7 was a good idea, but didn’t appear to have any affect. However, I did have some luck, after a lot of tinkering, with making a small change to the redirect plugin to exclude part of its normal operation when tru_tags is present. I can’t really explain how it works or why it doesn’t [appear to!] break anything, but I tentatively think it may have done the trick. Right now, I have nice and clean tag urls working in conjunction with the redirects. I’m going to try to actually understand what it did — and if I can make sense of it, I’ll post it here or to the forum. Thanks again for the help and for a really extraordinary plugin. Cheers! Weird – I could have sworn I was finding no problems but now I am not seeing the display of tags-available (yellow background) on the Write page. I am sure I was seeing this. I do have the Extension tab set to display this. I have deleted and re-installed tru_tags. I am using 4.0.8 RC2, but I was 99% sure I saw the yellow tags before I went from 4.0.7 to 4.0.8 RC2 (but maybe I am wrong there?). Any clues, easiest being, do you know if I should be able to see the yellow tag-chooser in 4.0.8 RC2? Tags seem to be working fine, just the Admin side display (which is brilliant when working so am sadly missing it). Any comment MOST gratefully received. I don’t know of any problem with 4.0.8, although I haven’t tried it myself. There have been a few reports on the forums about this problem, but it’s always been intermittent, and I’ve never been able to figure it out. Sometimes reinstalling the plugin fixes it, but apparently not in your case. Would you mind letting me into the admin side of your site to see if I can debug it? If that’s OK, please send credentials to truist-20090122@rainskit.com. Absolutely brilliant. Really professional plugin. I installed tru_tags 3.5 yesterday on my site http://www.magnus.burgsvik.se and realized that I still miss important things, then it comes to tagging, which should make Txp a real good blog platform for me. 2. Sorting the Swedish alphabet doesn’t work correct. Å, Ä and Ö comes last in the Swedish alphabet, but tru_tag sport them first. I realize that with my “small” language it is not the best choice to us a CMS with a quite small user base word wide. Anyway, thanks for your work, so far, Nathan. I’ve used tru_tags before, and I LOVE it. The only problem is, I’m working on a site that needs tagging for different sections in order to function the way I’d like it to. I was thinking that wouldn’t be a problem at all, since the two sections won’t ever need to share the same tag (i.e. If the two sections never share the same tag, then clicking on a tag would never return results from both sections). However, I also need the results to display each within their designated section, so the fact that tru_tags works using it’s own section is a limitation for me. I can set that section to display like one of the sections, but then when people from the other section click to list posts for a tag, their results would appear to be displaying in a totally different section. For example: section 1 is “Blog”, section 2 is “Testimonials”. I want people to be able to sort blog posts by tag, but I also want the testimonials to be sortable by tag. However, if I set the section page to display like the Blog page (with the sidebar and various section-specific elements in place), then people clicking to sort testimonials will get their results displaying the same way, and think they’ve somehow been redirected to the blog section. Mave, this is a tough problem. After thinking it through for a while, I can’t see a solution that would work with a stock tru_tags, and I can’t think of an easy way to modify tru_tags to support multiple tag sections. You’d then have to write the inBlog() function to somehow figure out the user’s current context. I think, then, that you could create the two appropriate sections and tru_tags would handle the rest correctly. But you’d want to test it very thoroughly to be sure. Just came across an issue w/ hyphens in tags and I don’t understand from the docs whether there is a solution. If a tag has a hyphen (e.g. “photo-electric”), clicking its link generated by tru_tags_cloud or tru_tags_from_article yields a 404 because, basically, I’ve no way to tell tru_tags_handler the equivalent of striphyphens=‘lookup’. What am I missing, pretty please? Curious: what was the rationale for choosing hyphen as a space replacement, since hyphen is common in natural languages? Tags with hyphens should “just work” without using striphyphens at all. If you are using striphyphens, try just taking it out and see if that fixes it. If not, I’ll need a more detailed example (feel free to email me directly). I checked my test site, and tags with hypens are working just fine, so I don’t think it’s a bug in the plugin. As to the rationale: there isn’t really one. I just didn’t know any better, back when I started tru_tags, and once I did learn better, I didn’t want to break backwards compatibility. I think there might have also been limitations with the way older versions of Textpattern stored keywords, but I can’t remember now. Really the only time you should ever need striphyphens is with tru_tags_tag_parameter, if you are planning on displaying the “searched tag” in your search results page. (That’s the common use-case, any way.) I don’t think it should be necessary under most other situations. p.s. I just implemented a fix in my copy of your source as follows: For every replace() invocation that toggle hyphen/space, I replaced the one hyphen with two hyphens. So the links show “nuclear—non-proliferation” (2 hyphens hard to read here). I don’t see what incompatibility this might introduce… A quick test showed it fixed my issue and didn’t break anything else. I guess this breaks any bookmarks out there, is all. I’m just installing your plugin on a local test site before going live. My tag cloud has commas outside of the anchor. Can I get rid of these commas altogether? I’m not sure I understand exactly what you are saying, but I’m guessing the “break” attribute on tru_tags_cloud is what you are looking for. Is there a way to show only the article excerpts in the results of clicking a tag, instead of the entire article? I have listform and form set in my article tag on the page used to display the output, and it totally ignores it and just shows the full article, which means a lot of unnecessary scrolling for the user. I have a different form called “search_results” for the tag list and use this code to serve up the correct form. I use a plugin called rss_auto_excerpt to make an extract limited, in my case to 30 words. I hope that this helps. If you want more information Nathan has my email address. Phil’s method is the right way to do it (for tru_tags). Because of the way textpattern is designed, there’s no (reasonable) way to make “listform” work with tru_tags. I know I’ve said it before, but it warrants repeating: tru_tags is awesome. Thanks for the hard work!! Thanks for this great TXP plugin. It’s really the best for tagging at TXP. I just using <txp:tru_tags_cloud /> copy/pasted straight from this page… If you’ve got any ideas for troubleshooting, please email me. thanks! melissa – Did you get this fixed? I see a tag cloud at http://yoursite/tag/, and I see a tag cloud in your left sidebar. Please let me know if you are still having trouble. melissa – What version were you on before your upgrade? tru_tags should work with 4.0.7 or higher, but I haven’t tested it with an old version in a long time. And you’re the first person I know of who upgraded to 4.3.0 (including me), so I’m glad to hear it’s working. Please let me know if you see any problems. Is there any way for me to know if a search-tag matches a specific string like .. if tru_tags_search_tag tag-name=“wargame” as a container construction ? My idea would simply be to make 8 if-statements on the tag section page and output appropriate forms. Any thoughts would be greatly appreciated :) Thanks. Specifically: If you found this article interesting, you may also like this one ..
I’d like to post a list (thrugh a form) of articles related to the article I’m currently rendering. I’d need the related list to have a limit and a sorting-order plus a section to pick the articles from. So in plain english, a random, short list of articles wich has a specific tag and are committed to a specific section. ie. section=“games” .. and I’d like to run that list through a form so I can post the image associated with each item. I’m fully aware that one article can have several tags .. but I’m guessing you’re allready doning somthing random .. or I was hoping the random sorting perhaps could come in play. Wow, this is a tricky one. You are right, tru_tags isn’t really designed to provide this feature, but it is a great idea. I think it might be possible, by using tru_tags_archive with the keywords attribute with a carefully constructed version of tru_tags_archive. Note the single quotes on the keywords paramater (see here for why. And I’m not sure if tru_tags_from_article will actually do the right thing with the listlimit attribute; maybe try ‘limit’ if listlimit doesn’t work. And “2” was an arbitrary choice; you might prefer “1”. If this works, you’ll need to make the “related_articles” form, to see any output for each article. Hi Nathan, i am using tru_tags on 4.4.0, works like a charm. As I’ve seem to have seen a warning further above about the tag clouds eventually generating server load problems on sites with higher traffic i wonder, if you’d see a way for instance to render tag clouds only once a day/hour and use a sort of stored version of the rendering in the meantime? Just a question, much respect to your work. Thanks for the feedback. For the server load (if you’re seeing a problem), I think aks_cache would probably do exactly what you want. Tag cloud does not appear. Finally I got it displayed. Looks like tag font size does not deppend on frequency mention. P.S. It is not easy to use (install). I’ve just installed your Trutags plugin on another blog here http://blog.aislabiewalk.org.uk/. This time using Textpattern 4.4.1 and it works perfectly. For those who have difficulty installing the plug-in I have to say that the basic installation is really simple. There are 5 steps as detailed above but they are only little steps and I don’t see how it could be simpler. I use it along with Rob Sable’s rss_auto_excerpt plugin which makes pulling an excerpt snippet into the search results for really simple. Thanks again for continuing to make this useful plugin available to the Textpattern community. I’m new to Textpattern (coming from WordPress) and I’m confused. Everything works fine. But I’m trying to make it so when you click on a tag in an article, it shows an H1 / H2 tag with the name of said tag followed by the tagged articles on a new page. Just kind of stumped trying to show the tag’s name. Everything else works fine. You should just be able to use tru_tags_tag_parameter (http://www.rainskit.com/reference/497/trutags-usage-instructions#tru_tags_tag_parameter) in an H1 tag. You may want to put that at top of the ‘page’ that renders your tag search results, wrapped in a tru_tags_if_tag_search.